With his back against the wall, Ben Johnson saves Collingwood's season with a desperate tackle on Port Adelaide's Peter Burgoyne in the goal square during the last quarter of the 2002 Qualifying Final. With his back against the wall, Ben Johnson saves Collingwood's season with a desperate tackle on Port Adelaide's Peter Burgoyne in the goal square during the last quarter of the 2002 Qualifying Final. Ben Johnson runs down centre wing against Essendon on ANZAC Day 2012. Collingwood premiership defender Ben Johnson has today announced his retirement from AFL football with immediate effect. Having suffered an unfortunate run of injuries since last featuring at senior level, against Hawthorn during round three, Johnson has made the decision to step away from football after 235 senior AFL games. “I’ve had a wonderful time. I loved the club before I got here and I am as passionate about Collingwood today as I was then,” said Johnson, who was chosen early in his career by former great Gavin Brown to wear the number 26. “It’s been a great ride. We enjoyed some great times, played some great footy and I’ve met some amazing people, including some of my best mates. A quintessential clubman, ‘Johnno’ was an ever-present member of black and white sides for over a decade. He retires with a reputation as a big occasion player – he won the 2006 Anzac Day medal and played many a good final - and as a particular favourite of the Magpie army. President Eddie McGuire led the tributes to Johnson, describing the half-back flanker as one of the club’s greatest servants. “From the moment he asked for permission to ask Gavin Brown for his number – he had tears in his eyes when Brown agreed – you knew ‘Johnno’ would give everything he had for the club,” McGuire said. “He was passionate, loyal, tough and selfless, and he gave us two of the greatest highlights any of us will ever know. His tackle on Peter Burgoyne in the qualifying final of 2002 was a match winning moment that ended Collingwood’s long finals winning drought. “And the goal he slotted in the 2010 grand final – you could tell it meant as much to him as it did to every Collingwood supporter. Senior coach Nathan Buckley hailed Johnson’s long contribution to the Magpies, praising the 32-year old for his tenacity and commitment to the Collingwood guernsey. “Ben has represented the club with distinction, but I think more importantly with great passion,” Buckley said. Drafted in 1999, Johnson fast overcame any qualms over his unorthodox kicking style to emerge as one of Collingwood’s generation next, a group of players that included Leon Davis, Josh Fraser and close friends Chris Tarrant, Rhyce Shaw and Alan Didak. It was this new blood, blended with a senior corps that included Buckley, Scott Burns, Tarkyn Lockyer, Paul Licuria and Anthony Rocca, that flowed through the grand final sides of 2002 and 2003 and helped to drive Collingwood’s renaissance in the first decade of the new century. A veteran of five AFL grand finals and three pre-season deciders, the high watermark of Johnson’s time at Collingwood arrived in 2010, when he played a pivotal role as a senior figure in the club’s 15th premiership campaign. 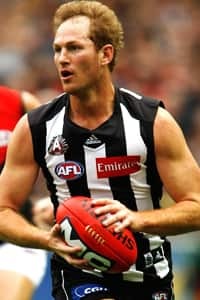 While perhaps underrated by the wider AFL community – he eschewed the spotlight for the sanctuary of the change room - Johnson’s achievement in ranking 14th on Collingwood’s all-time games list, claiming the R.T Rush Trophy in 2004 and 2006 and winning the 2006 ANZAC Medal speak of a durable, high order talent.